We don't just copy an old PAF. Our Humbuckers were designed from the ground up to sound better than that and we've come out on top in various magazine comparisons precisely because of the tone and response, not because we tried to copy some 1950's assembly-line product. Also, each of our pickups (Dedicated Neck/Bridge models in both Open and Covered versions) are not just the same pickup with a few turns of wire more or less. Each is a unique design that's been completely optimized for that particular model and it's position. All Harmonic Design Vintage Plus Humbuckers have a fat, rich tone that remains cleaner and more articulate that the usual suspects, combined with more dynamic range for a more expressive, musical feel. 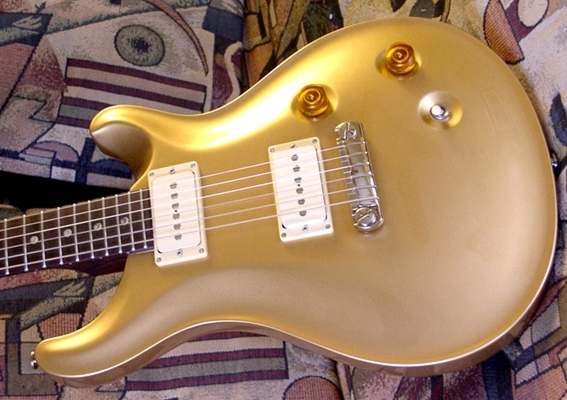 The wide dynamic range can also be described as a more "single-coil" type touch-sensitive response. These pickups are specifically voiced to drive a tube amp with a warm amp-friendly tone without that just-noticeable midrange distortion or edgy treble of other modern humbuckers. Our pole screws are each CNC machined from Silicon Steel and work together with our pickup's greater response to pickup height adjustment to provide for fine-tuning the tone to a particular guitar. We wire these up with our custom-made braided Silver cable that provides for simple vintage-type wiring as well as coil-tapping or PRS 5-way switching. 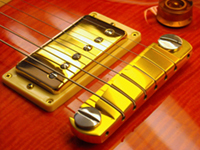 The Nickle or Gold covered version has a more rounded treble and strong midrange. 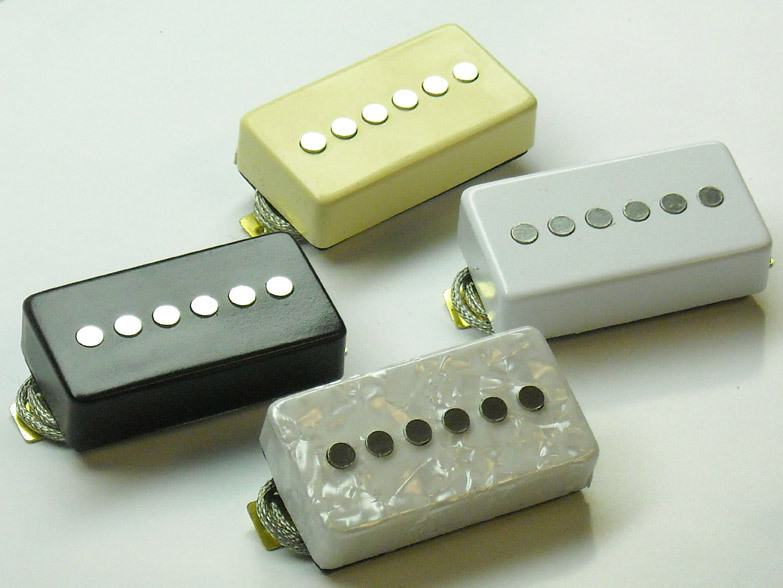 These roughly match the output of a McCarty or loud PAF pickup, but with more of our rich, fat and clear tone. The matched neck humbuckers have been re-designed for a cleaner and more articulate tone with greater string separation. Use these with the stock tone capacitors, or with our 'orange' tone caps (included) to extend the brightness. The open Double Black pickups are not the same pickup with a cover slapped on, they're a separate, dedicated design for a tone with a wider range (slightly deeper and brighter) and stronger harmonics. 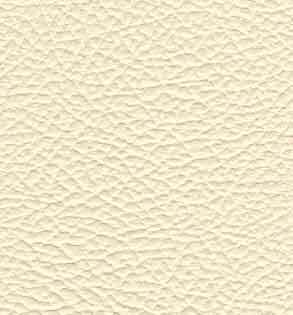 They work best with our paper and oil tone caps (included). These are about the same output as Burstbucker Pro or PRS Dragon pickups. 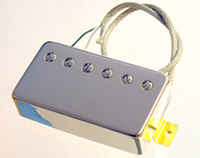 Large single coil pickups can have a wider tonal range than humbuckers and many players prefer the "spank", or wider dynamic range of single coils. Our Z-90 is the Original humbucker-size single coil pickup, and will drop right into your stock humbucker routing and mounting rings, with no modifications to the guitar. 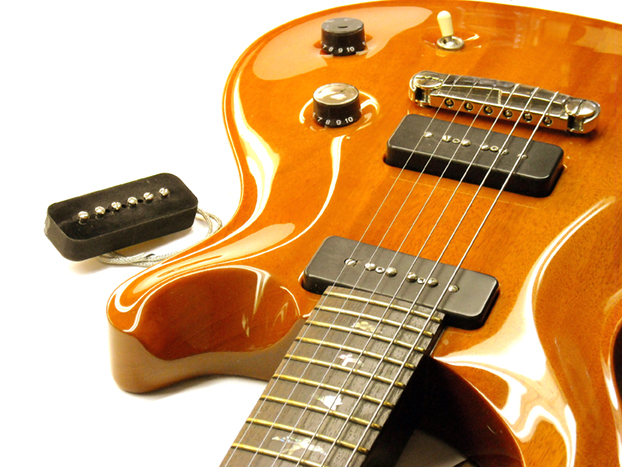 The Z-90 matched set uses two completely different pickups for the neck and bridge positions. The oversize pole pieces provide a higher output and richer bass response, and allow for string bending without loss of output. 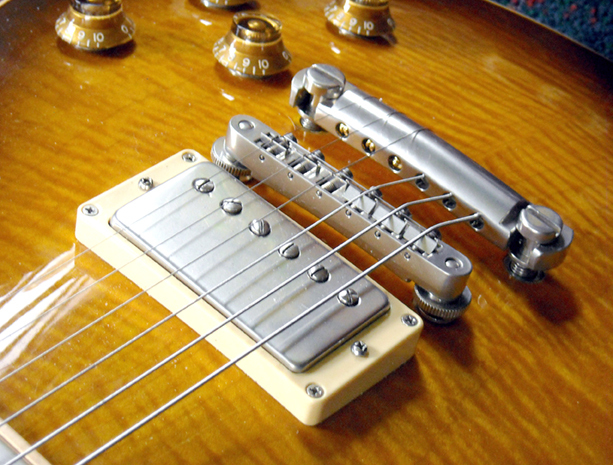 The neck pickup uses an oversize magnet structure to tighten up the fat bass response. The bridge pickup uses a special bobbin and winding technique to allow 30% more turns to balance the neck pickup with an even hotter output, and give you a huge, fat sound with incredible range, punch, and clarity. 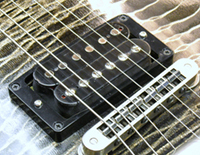 Introduced in 1994, Z-90 pickups continue to generate rave reviews from guitar magazines and pro players everywhere. 'Open' sound. Big, expressive tone that you can adjust from 'smokey' to 'crisp' by changing the height adjustment. Z-90s drop right into standard mounting rings to allow height adjustment and easy retro-fitting to any humbucker type guitar. The Z-90's oversized pole pieces will accommodate both Gibson and Fender string spacing and just about anything else in the neighborhood. 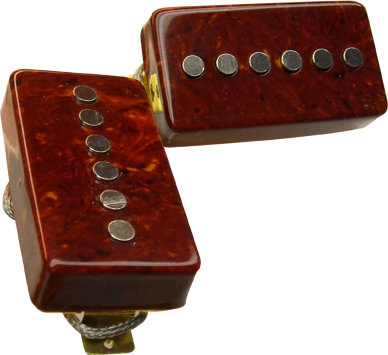 So replace them pesky humbuckers with the ULTIMATE single coil tone! add $5 for pearl, tortoise or chrome. 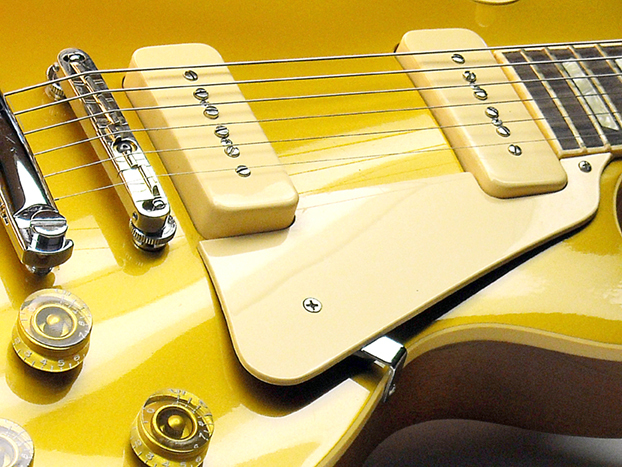 VP-90's are not just another P-90 copy, They have everything that's cool about classic P-90 sound, but vintage P-90's and their clones also tend to have a blurry, indistinct tone on the neck pickup, with a relatively nasal-sounding bridge pickup. The VP-90's change all of that in a big way, The "VP" stands for 'Vintage Plus' with a fat, clear, expressive sound from both pickups that will absolutely blow away the originals with a lot more of that punchy vintage soul, and less noise. So If you crave the classic tone and expression that some of the old P-90's hint at, but with much better range and balance, then VP-90's are the way to go. "Gorgeous sound, great feel...fuller-sounding and MUCH broader frequency range...very nicely balanced. 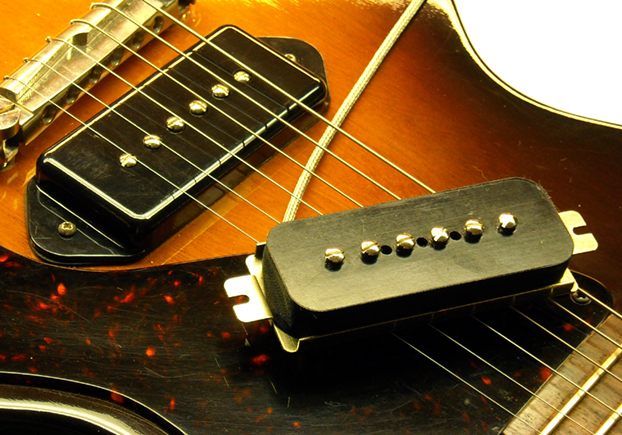 They don't really sound like all the other P-90's out there...but that's the point. VP-90 in Soapbar or Dogear style baseplates- $115 each direct price, includes cream or black covers.